EVERY year, the best of the best gather. Boxers. Triathletes. Golfers. Motocross champions. Bowlers. Taekwondo black-belters. Scrabble mind experts. Cyclists. Mixed Martial Artists. Over 180 of Cebu’s top athletes and sportsmen meet. Some, like Donnie Nietes, are world champions. Others, like Irina Gabasa and Igi Maximo and Arthur Craig “Iggy” Pantino, are the best in their juniors categories. A few -- like the Cebu Volleyball Association (CEVA) or the Cebu Tenpin Bowling Association (CETBA) -- are organizations. One is a company and family name whose athletic involvement spans decades and a multitude of events: Aboitiz. All are champions and supporters of one discipline: Sports. The event? It’s this Saturday. when Z Gorres arose from his wheelchair and walked forward to personally accept his trophy—the Cebu Sports Awards had been exclusive. Same in the years past. Grand Convention Center. Laguna Garden Cafe ballroom. And several other “by-invitation-only” venues. All exclusive. Not two afternoons from today. 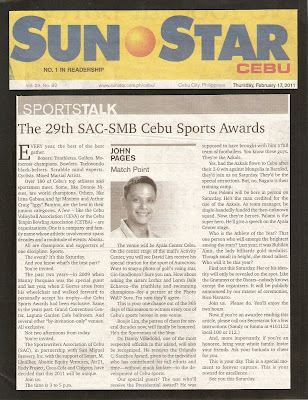 The Sportswriters Association of Cebu (SAC), in partnership with San Miguel Brewery, Inc. with the support of Smart, M. Lhuillier, Aboitiz Equity Ventures, Air21, Rudy Project, Coca-Cola and Citigym, have decided that this 2011 will be unique. The time is 3 to 5 p.m. The venue will be Ayala Center Cebu. On the center stage of the mall’s Activity Center, you will see David Lim receive his special citation for the sport of Autocross. Want to snap a photo of golf’s rising star, Gio Gandionco? Sure you can. How about asking the sisters Lorhiz and Loren Dale Echavez--the triathlete and swimming champions--for a picture at the Photo Wall? Sure. I’m sure they’ll agree. 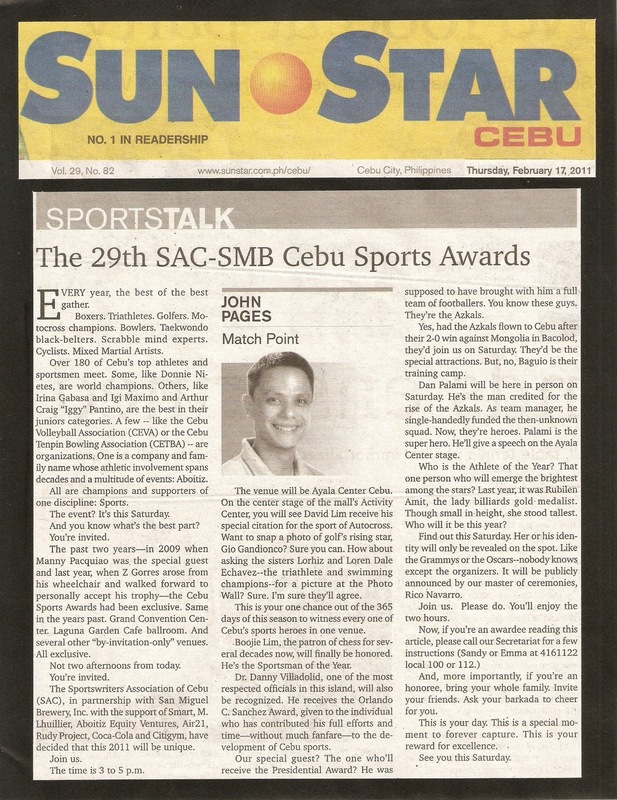 This is your one chance out of the 365 days of this season to witness every one of Cebu’s sports heroes in one venue. Boojie Lim, the patron of chess for several decades now, will finally be honored. He’s the Sportsman of the Year. Dr. Danny Villadolid, one of the most respected officials in this island, will also be recognized. He receives the Orlando C. Sanchez Award, given to the individual who has contributed his full efforts and time—without much fanfare—to the development of Cebu sports. Our special guest? The one who’ll receive the Presidential Award? He was supposed to have brought with him a full team of footballers. You know these guys. They’re the Azkals. Yes, had the Azkals flown to Cebu after their 2-0 win against Mongolia in Bacolod, they’d join us on Saturday. They’d be the special attractions. But, no, Baguio is their training camp. Dan Palami will be here in person on Saturday. He’s the man credited for the rise of the Azkals. As team manager, he single-handedly funded the then-unknown squad. Now, they’re heroes. Palami is the super hero. He’ll give a speech on the Ayala Center stage. Who is the Athlete of the Year? That one person who will emerge the brightest among the stars? Last year, it was Rubilen Amit, the lady billiards gold medalist. Though small in height, she stood tallest. Who will it be this year? Find out this Saturday. Her or his identity will only be revealed on the spot. Like the Grammys or the Oscars--nobody knows except the organizers. It will be publicly announced by our master of ceremonies, Rico Navarro. Join us. Please do. You’ll enjoy the two hours. And, more importantly, if you’re an honoree, bring your whole family. Invite your friends. Ask your barkada to cheer for you. This is your day. This is a special moment to forever capture. This is your reward for excellence.